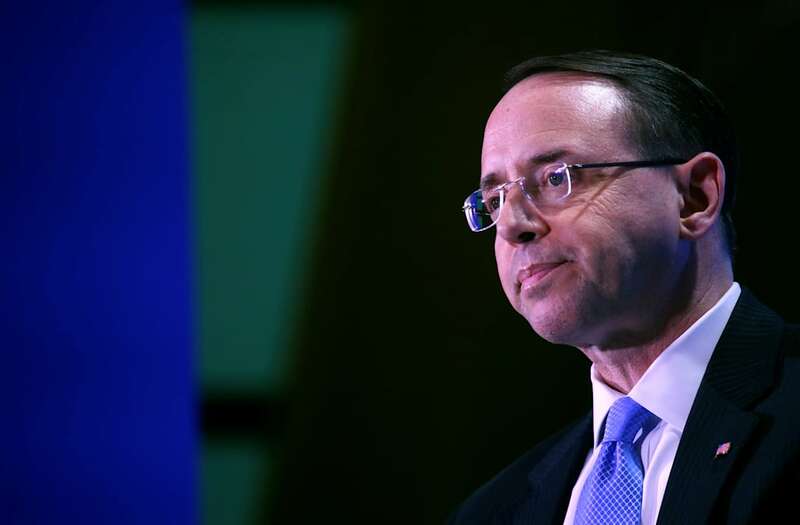 A group of conservative House members has drafted articles of impeachment against Deputy Attorney General Rod Rosenstein, who is overseeing special counsel Robert Mueller’s Russia probe, multiple news organizations reported Monday. The reported draft is the latest in an ongoing feud between Congress members allied with President Donald Trump and the Justice Department over its investigation into Russian meddling in the 2016 election. Members of the House Freedom Caucus, a group of conservatives led by Rep. Mark Meadows (R-N.C.), recently finalized the draft, The Washington Post reported. Meadows called it “a last-resort option if the Department of Justice fails to respond” to congressional requests for documents pertaining to the Russia investigation and another federal inquiry into former Secretary of State Hillary Clinton’s use of a private email server. A representative of Meadows did not immediately respond to a request for comment. The impeachment articles accuse Rosenstein of several transgressions, The Hill reported, including that he violated federal law by not immediately complying with a congressional subpoena to release documents regarding FBI surveillance during the 2016 presidential election. The documents also accuse Rosenstein of “knowingly provided misleading statements related to his supervision of the initial Department of Justice investigation into the Trump campaign’s alleged contacts with Russia,” according to The Hill. Rep. Devin Nunes (R-Calif.), who oversees the House Intelligence Committee, threatened to impeach Rosenstein, along with FBI Director Christopher Wray, earlier this month. “I can tell you that we’re not going to just hold in contempt. We will have a plan to hold in contempt and impeach,” Nunes said in an appearance on Fox. Trump and a handful of vocal conservatives in Congress have long mistrusted Rosenstein over his role in the Russia investigation. The president reportedly considered firing Rosenstein last summer. But an impeachment proceeding is unlikely to progress far. Paul Ryan (R-Wis.), the Speaker of the House, and other GOP leaders in the House have largely remained silent amid calls for Rosenstein’s impeachment or firing. USA Today also noted that the last time a member of the executive branch other than a president was impeached by the House was in 1876, when Ulysses S. Grant’s secretary of war, William Belknap, was accused of taking kickbacks. He was acquitted in the Senate.